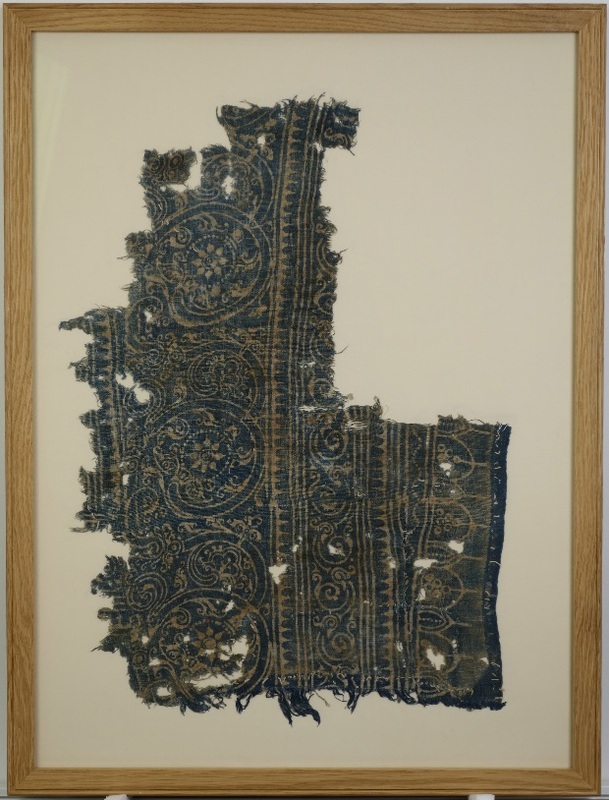 by Harriet Perkins, Second Year MPhil Textile Conservation student and Sarah Foskett, University Teacher. 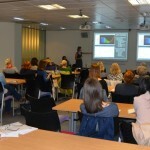 Every year, the second year students give presentations about the work placements they undertake in the summer. The presentations are a super opportunity for the students to share their experiences with staff, Textile Conservation Foundation (TCF) trustees and other students, including, of course, each other. This year the presentations were held in a lecture theatre on campus and the increased size of the venue meant we were also delighted to be able to welcome some funders and sponsors. The second years spoke with great enthusiasm and did a fabulous job of conveying the huge range of experiences they had on their placements. They demonstrated just how beneficial it is to be able to consolidate and develop their knowledge and skills and to gain an insight into their application in a professional context. 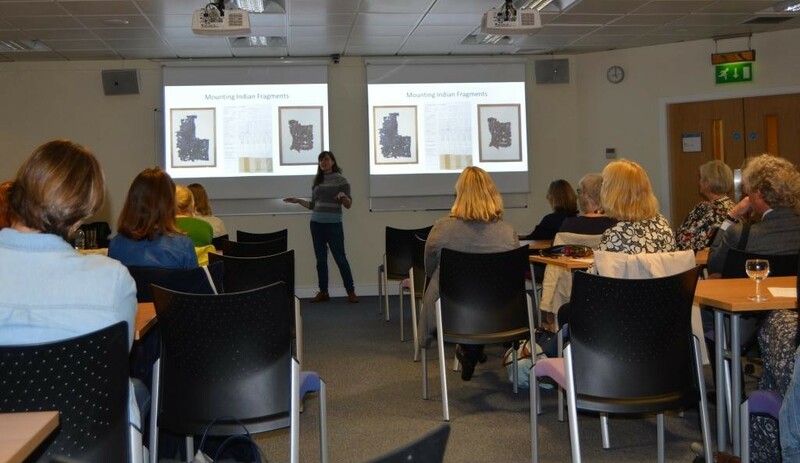 What also came across was not only the students’ passion for and commitment to textile conservation but that of their placement supervisors and colleagues whose generosity of time, experience and expertise had been of immense value and benefit. One of the presentations was by Harriet, whose reflections on her work placement at the Ashmolean Museum are recorded here. 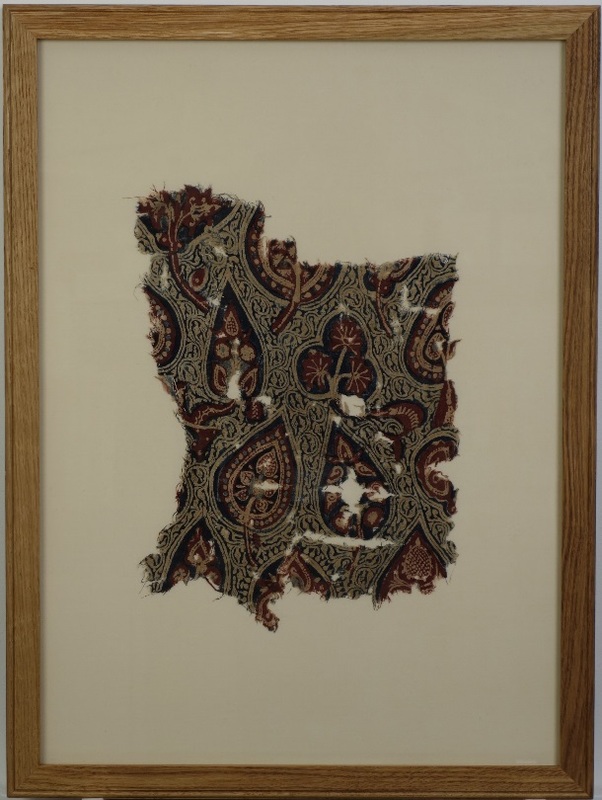 I hit the ground running on my work placement with the task of pressure mounting 2 Indian textile fragments to go on loan to the Fabric of India exhibition at the Victoria and Albert Museum in the autumn. The frames were standard sizes from the conservation store and I had to make padded boards to fit the frames including dyeing cotton fabric with which to cover the boards. As I enjoyed producing colors in the dye lab at the Centre this was a really enjoyable first activity to carry out. I created a range of 6 sample shades and then, having decided on the preferred colour, I successfully dyed a large batch of cotton. One of the most valuable aspects of the placements is learning new methods and techniques. Sue has a different method of making padded boards from the way which we are taught at the Centre for Textile Conservation (CTC) and I was keen to give this method a try. Her method uses an extra layer of Correx® board which although adds thickness to the board helps create an even tension on the cotton and I was pleased with the result. 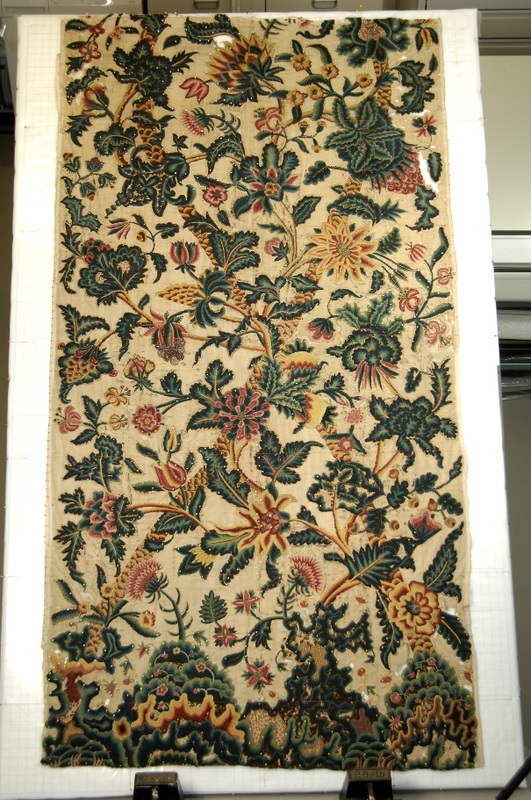 I was also involved in the ongoing conservation of a 17th Century crewel work bed hanging. The bed hanging had been previously wet cleaned, a treatment which not only brightened the object but allowed the weave to be realigned which removed many of the creases. As the colour of the ground fabric remained variable even after wet cleaning, Sue had dyed a range of colours for the patch support of areas of weakness and loss. I really appreciated the opportunity to consolidate my stitching skills through the project and to contribute to the conservation of this beautiful object. Rolled a tapestry to allow a gallery to be renovated. Undertook a survey of the mounting techniques of newly accessioned embroideries. 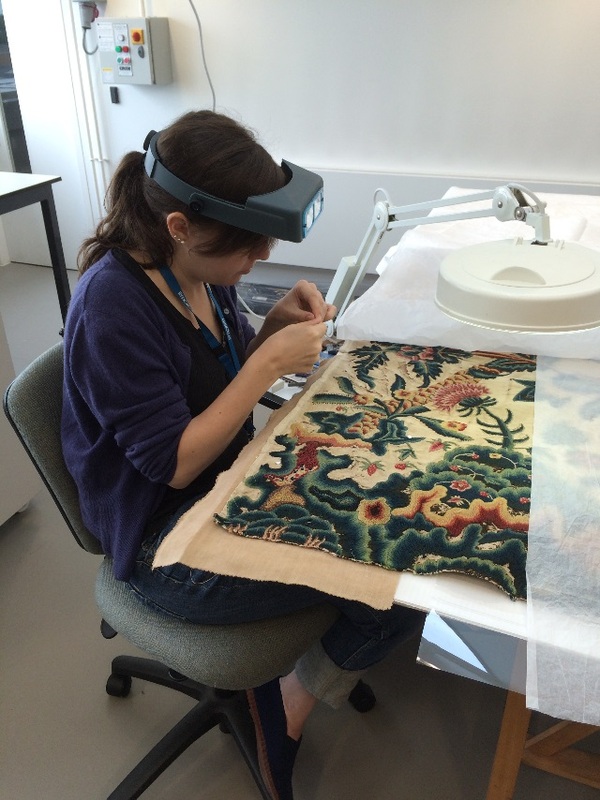 These activities brought home to me the dynamic and varied nature of textile conservation and the wide remit of textile conservators in museums. It also gave me an insight into the benefits and pleasures of working in a multi-disciplinary conservation team as well as with curators and other museum professionals. My time at the Ashmolean Museum has made me even more excited about the opportunities that will be open to me after graduation and about the prospect of textile conservation as a profession. It has given me confidence in the skills I have already acquired during the first year on the course and a renewed enthusiasm to develop and advance new skills during the academic year to come. Thanks Sue!